more enjoyment in the everyday with your child? practical skills and strategies for making life with children easier? confidence in your ability to raise happy, healthy kids? 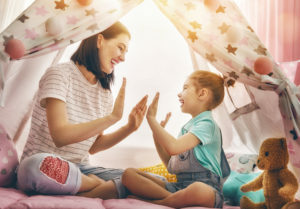 a deeper, more meaningful connection with your child? more laughter in “those” (and many other) moments!? a more positive outlook on the parenting journey? peace within relationships and yourself? stress reduction, and improved quality of life? Whether you’re working to define your approach, facing a particular challenge or truly feeling the crunch as a parent, YOU’VE COME TO THE RIGHT PLACE! Change starts now – check out the coaching and upcoming events pages. personally trained and certified by Dr. Laura Markham, Ph. D., founder of Aha! 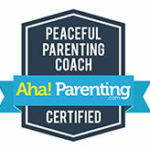 Parenting (ahaparenting.com), and author of “Peaceful Parent, Happy Kids” and “Peaceful Parent, Happy Siblings”. Ontario College of Teachers certified classroom teacher, bringing 15 years teaching experience, B.A, B. Ed., and many additional qualifications. Comprehensive Yoga Therapist and Yoga Instructor (780 hours) – trained in Classical Yoga, which uses Yoga practices holistically to empower lifestyle change. I began my professional career nearly fifteen years ago now, as a classroom teacher. I’ve always loved working with children and learning. When life threw me some major curve balls a number of years ago, I turned my love of learning inward and began to train in Yoga. I have had clients ask me how it is that I seem to know just where the struggle is and the answer is always that I have walked this path myself. I did not begin my parenting journey using the strategies of Peaceful Parenting, nor as a particularly mindful person. When my eldest daughter was 4.5, it came to my attention that she needed me to respond differently. This was the beginning of living Peaceful Parenting every day. I am now blessed with two amazing daughters, a vibrant mindfulness practice, and a life full of love, laughter and connection. I also offer the knowledge passed in trust to me to wrap you in kindness as we work together to bring you closer to the dream you are looking to build, one step at a time.